Cyclone Idai Made It Hard To Meet Basic Needs, From Soap To Pain Killers : Goats and Soda In the wake of the storm, even the most basic medical and personal needs aren't easy to meet. Tichanai Mutungwe, a farmworker in Zimbabwe, couldn't save his daughter from the flood waters. Injured and grieving, he says he must get back to work soon so he can support his family. Cyclone Idai was a major disaster. When it struck southeastern Africa on March 14, the storm destroyed more than 18,000 homes. The U.N. estimates that over 130,000 people are still in temporary shelters. The death toll is now 598 and expected to rise as officials reach remote areas to assess the damage. And in the wake of the storm, over 2,000 cases of cholera have been reported so far. Behind those large numbers are many stories that bring the tragedy to a human level. Matthew Chidambazina, 42, who lives on the estate, suffered severe arm and leg injuries after the roof of his home collapsed. It took seven days for medics to reach him. "I had deep cuts that went right to the bone and I needed stitches, but I couldn't get to the hospital on time," he says. "By the time the doctors came to the farm, they said it was too late [for stitches] so I've just been put on painkillers and antibiotics to reduce infection from the pus in the wounds." 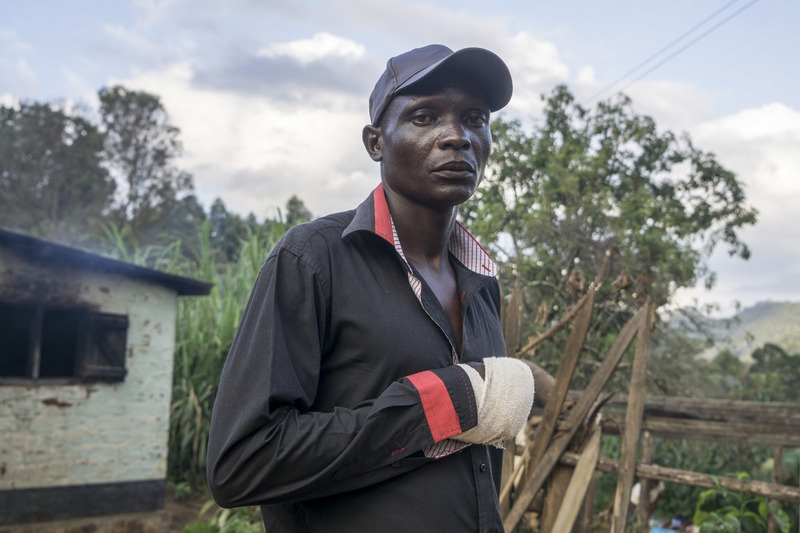 His co-worker, Tichanai Mutungwe, 38, bears both physical and emotional pain. He badly injured his arm while trying to save his 16-month-old child from being taken by the flood waters. The current was so strong that he couldn't hold onto her. Days later, Mutungwe found his daughter's body at the bottom of the slope from the farmworkers' houses. She was buried along with 10 others who died on the farming estate. Thirteen other residents are still missing. Mutungwe's right hand has deep lacerations and his chest hurts from being dragged by the muddy waters. He's been improvising to treat his injuries. "I use betadine to clean my wounds, but we don't have enough bandages or painkillers for my hand." And he feels he must recover quickly: "I've lost so much, but as a man I have to get back to work as soon as I can to feed my family. They need me to provide," he told NPR. Maidei Masawi, the village health worker for the Rathmore area, told NPR that despite ordering basic supplies from the Chimanimani Rural District Hospital for its outreach workers, only limited amounts of drugs and health-care equipment like gloves have arrived because supplies are limited. 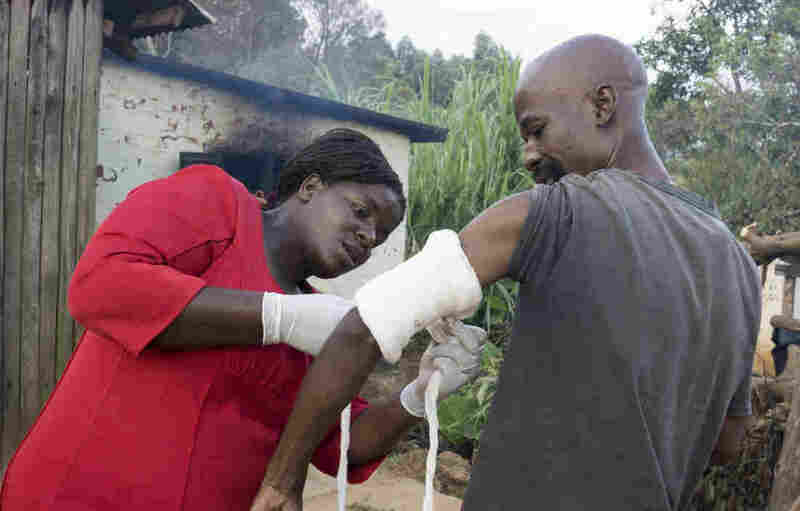 A village health worker tends to Matthew Chidambazina's arm, injured when the roof of his home fell on him during Cyclone Idai. He is a farm worker in Zimbabwe. "I've been asking for simple things like painkillers, but we can't get them," says Masawi. "There are small babies who are coughing and have this flu that won't go away, but there's nothing I can do for them. I can only wait to see what we can get from the outside aid." Health providers are struggling to reach people in remote areas. "We are making efforts to get to the patients in the field and we try to give them what they need, but the major challenge is accessibility," says Farai Marume, the emergency coordinator for Doctors Without Borders (Medicines Sans Frontieres). "We've tried to send some medications and team to assist at Chimanimani Rural Hospital, we have a list of the gaps and we're still trying to meet those gaps with our other [NGO and government] partners," he said. The bicycle that health worker Ndakaziya Maputuri typically uses to get to patients in the five villages she covers was of no use on roads covered with rocky debris. She's based in Charter district, a vast timber plantation district east of Chimanimani, which until last week been cut off access by roads. "There is nowhere you can reach with a car here, even with the bicycle I have," she says. "I'm trapped by the stones in the road. Even if I walk to visit people, I can't find them." That's because many people have left their homes and walked for several days to gather at distribution spots where aid is being delivered. While UNICEF Zimbabwe acknowledges the dilemma people face with accessing aid and essential medicines, Denise Shepherd-Johnson, the chief communications officer, told NPR the organization was trying to direct disaster-relief funds to ensure that ample medical supplies could be made available. "Essential medicines procured through UNICEF have been sent to affected areas. The challenge will be to mobilize resources estimated at $600,000 to replenish existing stocks of supplies being used in the response to the emergency," she wrote in an email. Annie Machokote waits for the distribution of buckets and soap to be distributed for washing up. She is also waiting for a new supply of her blood pressure medicine. The issue isn't just treating injuries from the cyclone. 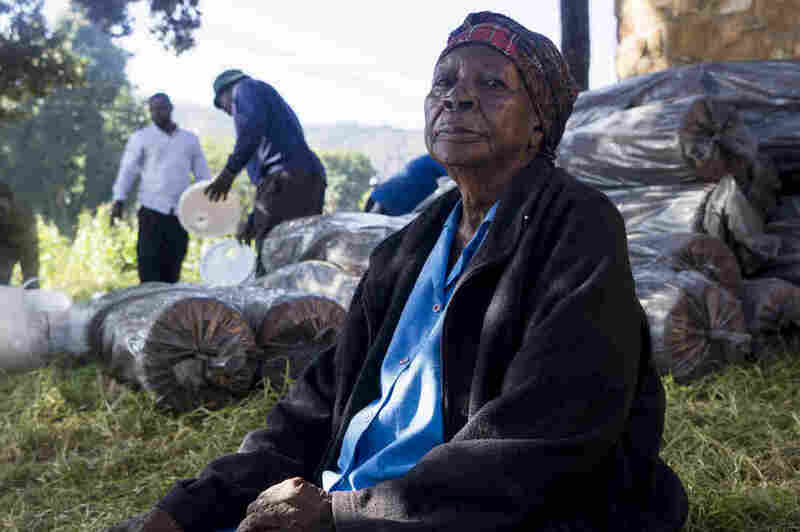 Annie Machokote, a 76-year-old-grandmother, has not been able to take her daily hydrochlorothiazide tablet to control her high blood pressure because the Chimanimani hospital has run out. Officials say they placed an order two weeks ago but are still waiting. "If anyone else can go and get them, please try. I've tried to ask, but now I will wait for what I can get. I need a bucket, soap [to wash herself] and a blanket. I don't know what will happen to me without the pills, but for now I will get what I can," she says. Tendai Marima is a Zimbabwean researcher and freelance journalist covering sub-Saharan Africa. Follow her on Twitter and Instagram @i_amten.